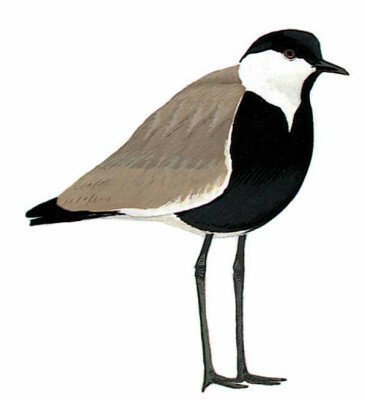 Elegant, long-legged plover, mainly sandy brown above, black head and underparts and contrasting white cheeks and sides of neck. In flight, tri-coloured: conspicuous white band between black flight-feathers and sandy wing-coverts; broad black tail-band; from below black belly and flight feathers contrast with white underwing-coverts. Flight action rather jerky. Juvenile similar to adult. Differs from White-tailed and Red-wattled by mainly black underparts and black legs.